The year kicked off with the first-ever edition of NCT South America, which was held in Bogota, Colombia. More than 80 regional and international delegates attended conference sessions on countering global IED threats, forensics and CBRNe capability building, and civil and military responses to CBRNe threats. Each day consisted of formal and informal sessions, providing a handful of opportunities for one-on-one networking between experts from the CBRNe Community in the region and end-users, bridging the gap between CBRNe technological solutions to the needs of military and government professionals. Overall, the event gave participants an opportunity to contribute to security in the region, in the context of the increased awareness of South America to the CBRNe threat, and the enthusiasm in developing defense capabilities. The fourth edition of NCT USA 2018 took place from April 3rd to April 5th at the Hilton Dulles Airport Hotel. The CBRNe Society once again had the great pleasure of welcoming new and loyal participants, speakers and exhibitors from a broad range of organizations that commit to making this world a safe and secure place. Almost 200 delegates and 16 exhibitors came from across the United States, South America, Europe and the Middle East to profit from the unique networking opportunities that NCT events offer. Following the NCT tradition, the event had a live capability demonstration performed by the Fairfax County Fire and Rescue Department Hazmat Team and the Fairfax County Police Department Bomb Squad. This year the real-life Hazmat-EOD scenario featured an improvised illegal drug laboratory situated in a hotel room, built in response to a call from a hotel about a guest who was taking and manufacturing drugs in his room. 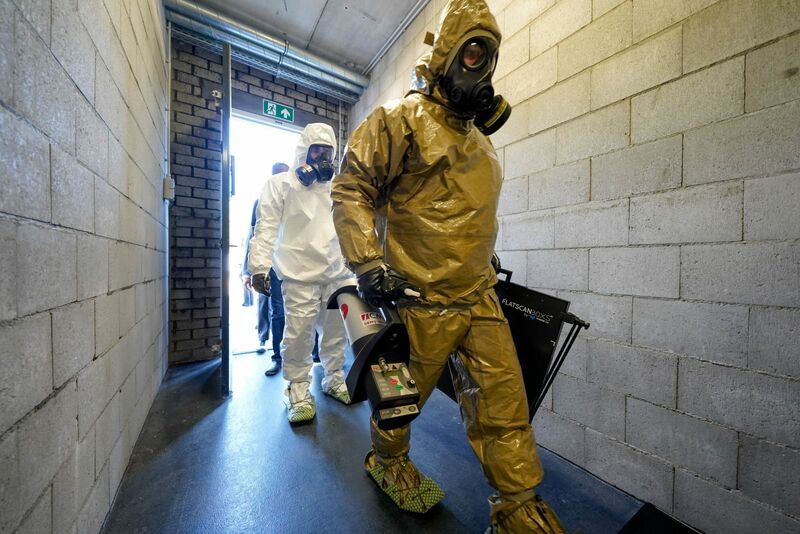 This live capability demonstration showed the importance of close cooperation between a hazmat team and a bomb squad in order to render the situation safe and secure. In light of recent events, the Fairfax County Fire and Rescue Department Hazmat Team and the Fairfax County Police Department Bomb Squad preformed a topical demonstration which alludes to the current opioid crisis that the USA is experiencing today. After NCT USA, the Event Team returned to Europe to partner with the Netherlands Ministry of Defense. NCT Europe was held at the Netherlands' National Training Center (NTC). The three-day event took place in Vught, The Netherlands, from the 3rd to the 5th of July. Once again, the CBRNe Society had the great pleasure of welcoming close to 300 new and loyal delegates, speakers and exhibitors from Europe, the USA, Middle East, Asia and South America. The leading CBRNe, C-IED and EOD event, NCT Asia 2018, was held in Hanoi, Vietnam in official partnership with the Military Medical Department of the People’s Army of Vietnam. Taking place at the Sheraton Hanoi Hotel from the 9th to the 11th of October 2018, over the course of the three days, the event hosted a conference stream, an exhibition and its famous networking receptions. NCT Asia 2018 acted as the perfect platform bringing together local, regional and international government representatives, leading industry experts, first responders and decision-makers to share their expertise in the fields of CBRNe, C-IED and EOD. Together with the support of civil institutions such as the Vietnam Agency for Radiation and Nuclear Safety (VARANS), NCT Asia 2018 closed as a very successful edition of NCT, and its 11th edition in Asia! The event welcomed 250 delegates, with important delegations from the host country Vietnam, as well as regional delegations from The Philippines, Hong Kong, Cambodia and Thailand amongst others. A few notable delegations present included local Vietnamese delegations from the Military Medical Department of the Vietnam People’s Army, the Chemical Corps, the Cambodian Department of Immigration and the delegation from the U.S. Department of Defense and Department of State.